Born in Oxford, England, Mark spent the early years of his life being educated on the island of Cyprus before a return to the UK in 1997 where he later studied for his doctoral degree in Biochemistry at the University of Oxford. During the course of his studies Marks love for guitar music grew into a passion that eventually saw him leave science and pursue a career as a classical guitarist. Mark performs to the highest standard, is well respected in the guitar community and has managed this as an entirely self taught musician. 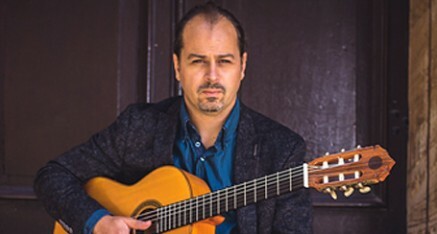 His compositions and arrangements have received critical acclaim fusing classical, fingerstyle and flamenco techniques. Inspired by the likes of Julian Bream, Paco de Lucia, Andres Segovia as well as more contemporary classical guitarists. Mark creates an ambient setting with bursts of spontaneous flare and impromptu improvisation. He is known for the clarity and detail you hear in every note giving 100% in every performance. Mark has recently released his latest classical works. Concierto de los Sueños, is a fully orchestrated classical guitar instrumental album.